This project will investigate the properties of nanostructured materials for use in solar and thermal energy conversion devices. The researchers will focus on materials exhibiting complex structures on multiple length scales and aim at predicting the electronic and thermal properties of these materials using a theoretical framework that combines ab initio molecular dynamics with accurate electronic structure methods. 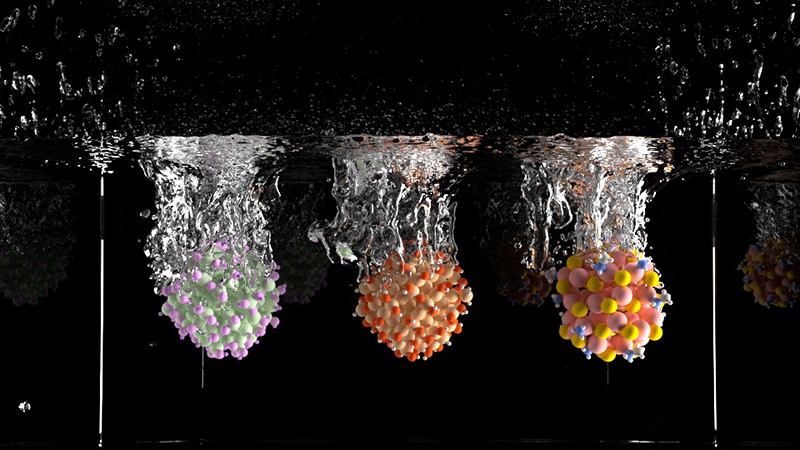 Ab initio simulations will be employed to compute ensemble averages of thermodynamic and transport properties of nanostructured materials with complex morphologies and compositions, inclusive of interfaces between nano- and meso-building blocks. The same trajectories will subsequently serve as input to many-body perturbation theory calculations to compute electronic properties. For solar cell materials, the team plans to focus on group IV and III-V nanoparticles terminated with a variety of ligands currently being tested experimentally; the most promising structures will be chosen for the initial runs on Theta. The researchers will compute band gaps and energy level alignment between ligands and constituent nanoparticles so as to optimize both quantities to increase the system hole and electron mobilities. For thermoelectric and solar-thermal applications, the team will focus on silicon-based clathrates, recently shown to exhibit promising solar and thermoelectric properties, and on solar perovskites. The researchers are developing specialized thermostats in the ab initio MD code Qbox to acquire the capability of computing thermal conductivities of complex systems from first principles. They are also developing techniques to compute Seebeck coefficients and conductivities, in addition to mobilities, from first principles, which, together with thermal conductivities will allow them to evaluate figures of merit of thermoelectric devices. Impact: Properties of materials to be used for solar and thermal energy conversion will be optimized at an unprecedented level of accuracy—by combining ab initio molecular dynamics and post-density functional theory (DFT) methods—thus providing truly predictive tools, ultimately for device performance, within a Materials Genome Initiative design framework. Computing thermal conductivity of clathrates and perovskites from first principles require ab initio molecular dynamics runs of ns length; these have never been carried out before and cannot be done with current HPC resources. Qbox is an ab initio molecular dynamics code developed at the University of California, Davis. It is based on DFT and a plane wave basis. At each step of the molecular simulation, the total energy and atomic forces are computed by solving the Kohn-Sham equations self-consistently using iterative techniques. It uses BLAS, LAPACK, and ScaLAPACK for dense linear algebra and FFTW or ESSL for FFTs. WEST is developed at Argonne and the University of Chicago. It implements a version of Many Body Perturbation Theory at the GW level which does not require the explicit calculation of virtual electronic states, nor explicit diagonalization of the dielectric matrix. GW calculations may be started from DFT inputs obtained either using semi-local or hybrid functionals. Qbox is based on the hybrid MPI+OpenMP parallelization model. WEST is also based on hybrid MPI+OpenMP. It partitions the total number of cores in a 2D N1xN2 array where N1 distributes the eigenpotentials used to expand the dielectric matrix and N2 distributes the plane wave expansion coefficients and FFT (all data structures are distributed both for N1 and N2). Thread-safe ESSL libraries are used for FFT and linear algebra. The optimizations carried out to port Qbox and WEST to many-core architectures (CPU- many-core track) will lead to improved data locality and high thread parallelism, and will thus facilitate the process of porting these codes to new architectures.